Given video games’ propensity for weapons of comic proportions, Link’s Master Sword and reasonably sized Hylian Shield from the Legend Of Zelda games display an admirable degree of practical restraint. 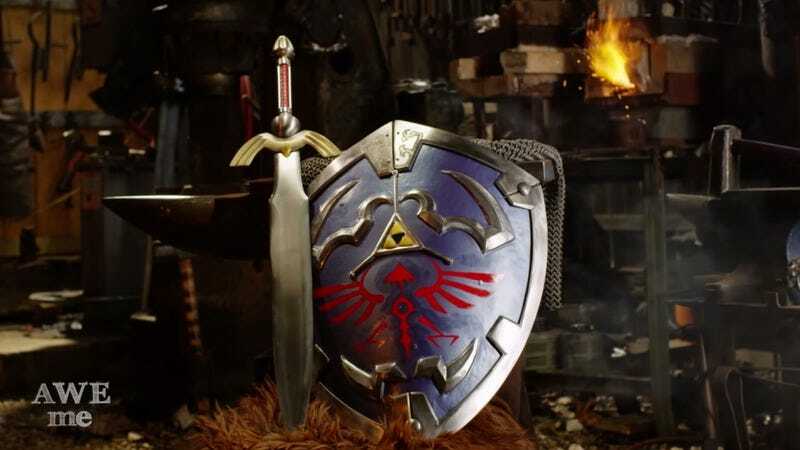 Plus, it’s fair to say that the Hylian Shield is one of the more attractive, colorful, and ornate-without-being-ostentatious pieces of gear in video game history–the kind of thing you’d feel very comfortable mounting on the wall of your office as a proud paean to nerdiness. You can find replicas of both of these pieces easily online, but fully forged, combat-ready versions? Not so much. In this episode of Man At Arms: Reforged, the talented smiths at Baltimore Knife And Sword meticulously recreate Link’s most popular pieces of weaponry (notably, the team chose to recreate the original Master Sword from The Legend Of Zelda: A Link To The Past, rather than a more recent iteration, which was recreated in a previous Man At Arms). The results are pretty impressive.